Shields are absolutely necessary for any radios hung on the same mast. Homemade shields described below will work, but you might as well just buy the $28 prefab RF Armor shields for Nanostation here and Nanostation Loco here. Despite better judgment, I have been rolling out some nifty homebrew "RF Armor" style shields on Nanostations and Nanostation Locos. 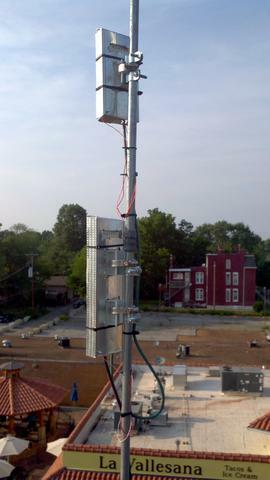 They yield particular benefit for any radios mounted on the same mast. Indeed, I'd say such shields are required for co-located radios, even with 2.4GHz and 5.8GHz units. You can readily diagnose mutual interference on co-located radios when your ping times jump up to 100's of milliseconds w/o substantial traffic load. The ugly detail is that Ubiquiti AirMax products actually operate internally at 2.4GHz, with translation to 5.8GHz, 900MHz, etc, such that shielding them from each other is necessary regardless of broadcast frequency. 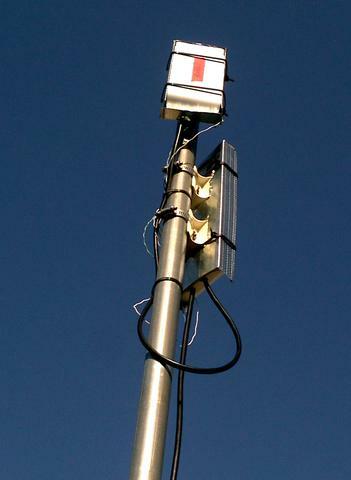 Professional WISPs may further stipulate that shielded radios also need substantial vertical separation (e.g. 3meters) if hung on the same mast. This is great if you have a 10meter tower with lots of height to play with, but I certainly don't. 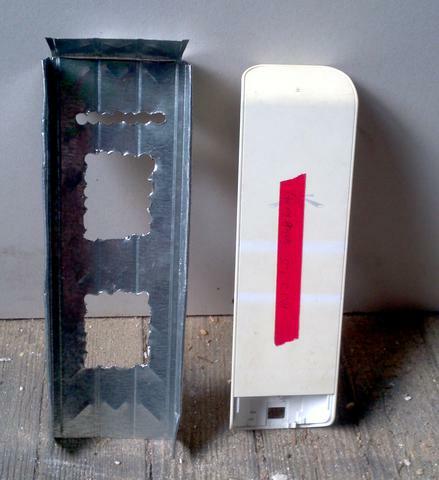 The shields pictured here were cut from 2x6" metal studs, available in 8-foot lengths for really cheap from any builders supply store. Aviation snips were used to cut the studs, along with a drill press and whatnot to make the cutouts for the radios' mounting arms. The cut shields were then bent into shape with pliers and a pair of gloves. Do not handle the cut metal bare-handed, unless you enjoy metal splinters. Lastly, attempts were made to de-burr and clean up the final result with a file, but the fact these things are hung high up, out of view, minimized such concerns. In the pictures, you see a small ground wire attaching the corner of the homemade shields to the mast (which is grounded). This is necessary to avoid excessive static electrical build-up, which could damage the radios. Additional photos can be found in the Picasa albums WasabiNet on Your Rooftop and Installation Details.